Miami continues to experience an explosion of excellent cultural and educational venues. The Phillip and Patricia Frost Museum of Science is sited at Bayfront Park on four acres with a series of four buildings containing 250,000 square feet of space. The museum buildings include the aquarium, the Frost Planetarium, and the North and West Wings. A grand undertaking in design, function and expense, this homage to science and the environment is a major educational asset and deserving of the community’s support. 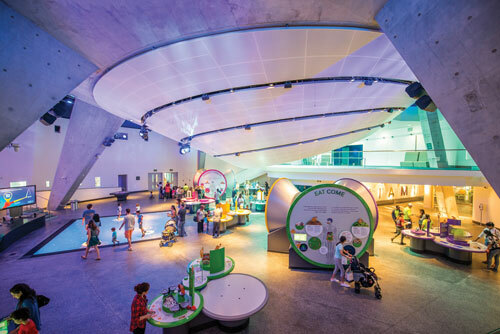 Opened in May 2017, the Frost Museum of Science commands a prominent place on Miami’s waterfront. Its predecessor, the Miami Museum of Science, provided science education to the children, adults and visitors in Miami-Dade County for 55 years. Located on three acres of county land at Vizcaya’s Farm Village, the old museum site included the Space Transit Planetarium and the Batchelor Wildlife Center. It closed in 2015. 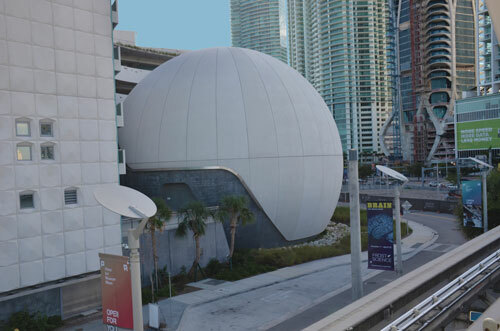 The Building Better Communities General Obligation Bond was passed by county voters in 2004 to create a new Miami Science Museum. In 2009, the City of Miami agreed to lease the museum four acres in Museum Park. In an agreement for naming rights, Dr. Phillip and Mrs. Patricia Frost pledged $35 million dollars in 2011 for the new museum. The architectural design firm for the museum is Grimshaw Architects, based in London with additional offices in Melbourne, Sydney and New York City. Transportation stations and museums are among their many projects worldwide. 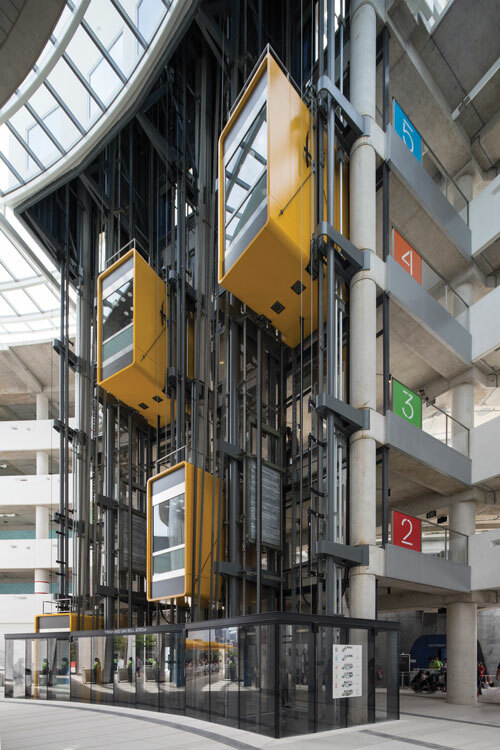 The firm designs in a high-tech style in which structural components of the building are exposed and treated as part of the design. Additionally, the style incorporates new technologies into the construction of the building, such as solar panels and reclaimed water. The museum complex was designed to take advantage of Miami’s climate, with the building opened to the southwest to make use of prevailing winds for cross ventilation. The outdoor program section allows for natural ventilation for external program areas that feature wildlife. The gallery areas are air-conditioned and there is a wind foil above the atrium to support convective air movement. Some energy sources built into the design take advantage of Miami’s sunlight by the use of solar panels, monocrystalline solar panels and photovoltaic thin film. Water is part of the thematic purpose of the museum, with water from Biscayne Bay entering the building for use in saltwater exhibits. Freshwater exhibits rely on filtered rainwater and reused fresh water. Rainwater is collected off roof surfaces and stored in the garage area which has a permeable surface. Rainwater is also used for HVAC and for irrigation of the museum’s live plant wall. The north and west wings are covered in a faceted white geometrical texture reminiscent of fish scales or the skin of a bird’s leg magnified and pixilated. There is an organic quality to the spherical planetarium and the large ocular viewing window at the top of seawater exhibits. The color palette is principally a soft white. The scale is massive. The museum’s concept was developed through the assistance of an interactive exhibit at the old Miami Museum of Science to determine what the community wanted in the new museum. 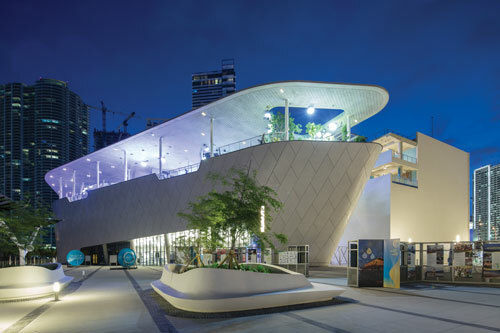 Grimshaw’s design adheres to the public input: sunlit space, exploration of the unique ecosystems of south Florida, a planetarium, exhibitions on outer space and human health and an expansion of the marine science programs with an aquarium. A principal goal of the museum is to be a readily accessible center for learning about our planet, outer space and something as small as the human cell. It is Grimshaw’s use of open and airy space and sense of design that invite the visitor to explore, moving among the different components and exhibits in a journey of discovery. Maps and guides are available, but the joy of moving through the spaces without knowing what comes next is something of a magical experience. Is that a mangrove swamp in the Everglades I see? Yes, yes it is–complete with live birds and real alligators sunning themselves. It is official: The study of science is rapidly losing its “geeky” reputation and finally gaining a stronger foothold in American educational institutions at all grade levels. According to the U.S. Department of Commerce, occupations involving Science, Technology, Engineering and Mathematics (STEM) are growing almost twice as quickly as other occupations. Also, according to the U. S. Labor Department, the 10 fastest growing occupations (2008-2018) and their median wages are among STEM workers. STEM education encourages critical thinking and inspires innovation. Promoting the sciences is the point of a cultural venue like a science museum. At the Frost Museum of Science, there is no age limit for learning. It is designed to capture the imagination, raise questions and foster critical thinking. And, yes, there is a large dollop of entertainment built into the museum experience, making it fun to learn for everyone from a toddler to a senior citizen. The best way to experience the museum is to start at the top. Take a glass elevator to the rooftop (6th floor) and enjoy a panoramic view of Miami from Biscayne Bay to the canyons of high-rise buildings, and beyond. The fifth floor houses classrooms and administrative offices. 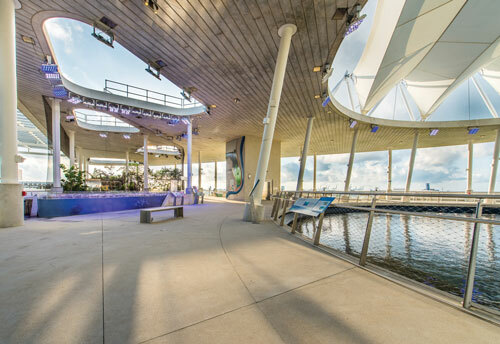 One floor down, the exhibits include the River of Grass, Everglades, Florida Bay Touch Experience, the Spencer Aviary, Coral Reefs and the top of the Gulf Stream Aquarium. 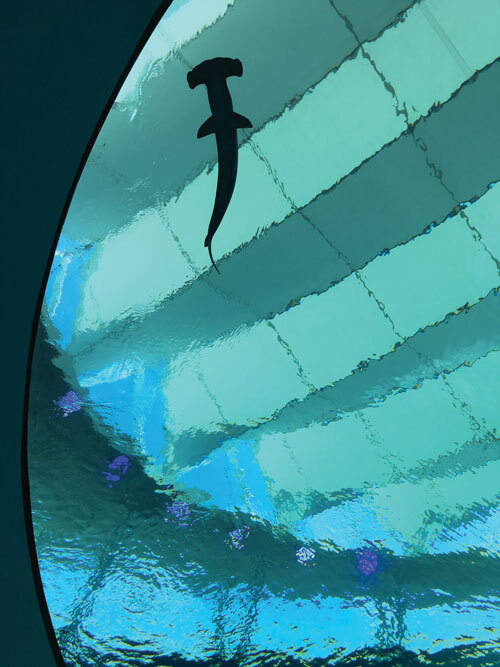 The aquarium is conical in shape, holding 500,000 gallons of saltwater and spanning three floors of the museum. On this floor, you can touch a stingray, see alligators and a crocodile, and look for a guest of the bird sanctuary with its handler who can tell you all about the bird. The aquarium continues downward to the third floor and the exhibit Feathers to the Stars, about birds, flight and space exploration. 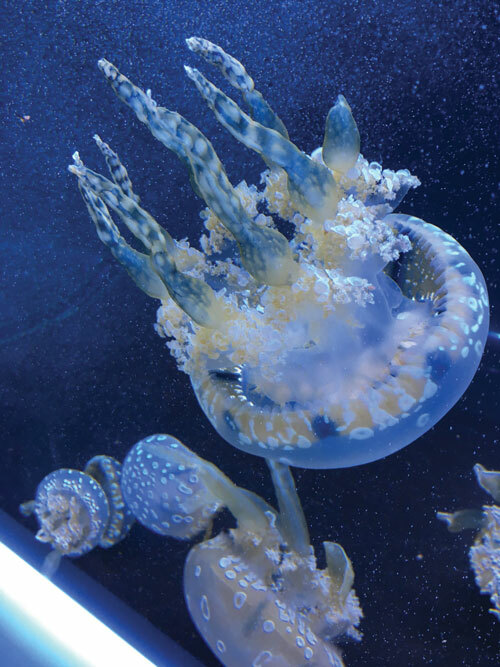 On level two is the huge Gulf Stream oculus and a fascinating look at live, lacy jellyfish. The first floor includes the entrance to the planetarium, store, dining facilities, ticket area and currently, an exhibit all about the human brain, complete with interactive activities. Exhibits, some permanent, some traveling, are located on levels two through four. Other guest experiences on various floors include the Dive Bar for hands-on exhibits, dancing in the MeLaB, and Baptist Health’s series of small exhibits about the human body and mind called Bite-Size Science. 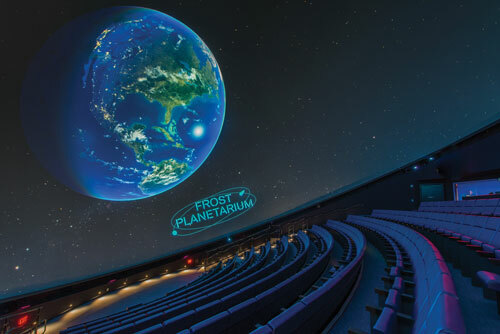 The Phillip and Patricia Frost Planetarium holds 250-seats and uses 16-million-color 8K projection, surround sound, within a seemingly infinite dome. The planetarium features a series of shows, such as Dynamic Earth, To Space & Back, Asteroid Mission Extreme, and special laser shows on Fridays. How does a community express its interest in establishing cutting-edge cultural and educational institutions? Quite simply it does so through generous philanthropy and by supporting the venue by simply going there to experience and enjoy it. This museum belongs to you, thanks to funding from the substantial General Obligation Bond that voters approved almost 14 years ago. It also requires the selflessness of major gifts to the institution, such as those given by Phillip and Patricia Frost: $35 million naming rights for the museum in 2010 and $10 million naming rights for the planetarium in 2015. Dr. and Mrs. 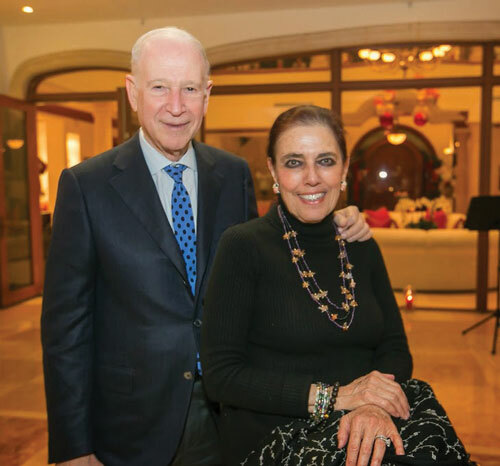 Frost have supported education and the arts in the community, among them endowing the Patricia and Phillip Frost School of Music at University of Miami and as lead donors for the Patricia and Phillip Frost Art Museum at Florida International University. 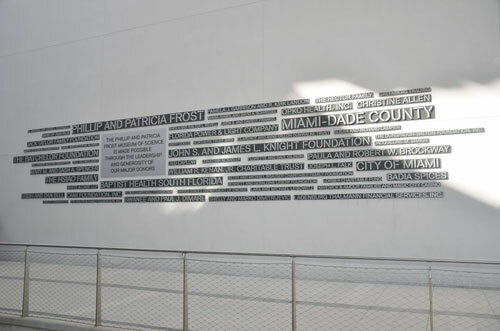 Other notable donors to the museum include Baptist Health South Florida, John S. and James L. Knight Foundation, Miami-Dade County Department of Cultural Affairs and the Cultural Affairs Council, the Miami-Dade County Mayor and Board of County Commissioners, The State of Florida, Department of State, Division of Cultural Affairs, the Florida Council on Arts and Culture, Badia Spices, Florida Power and Light, Trish and Dan Bell, William R. Kenan, Jr. Charitable Trust, Mary M. and Sash A. Spencer, The Batchelor Foundation, Christine Allen, Joseph L. Falk, Hsiao Family Foundation, and a host of others. The museum welcomes your membership, support and volunteerism. There are discounted tickets available for Miami-Dade residents. Here’s one word of advice: Use public transportation. Take the Metrorail to Government Center, board the Omni Loop, arrive at Museum Park and walk a very short distance to the museum. The Perez Museum of Modern Art (PAMM) is nearby. Even though the site has a large parking facility, by taking public transportation, you can help support the museum’s mission to consider the needs of the environment. 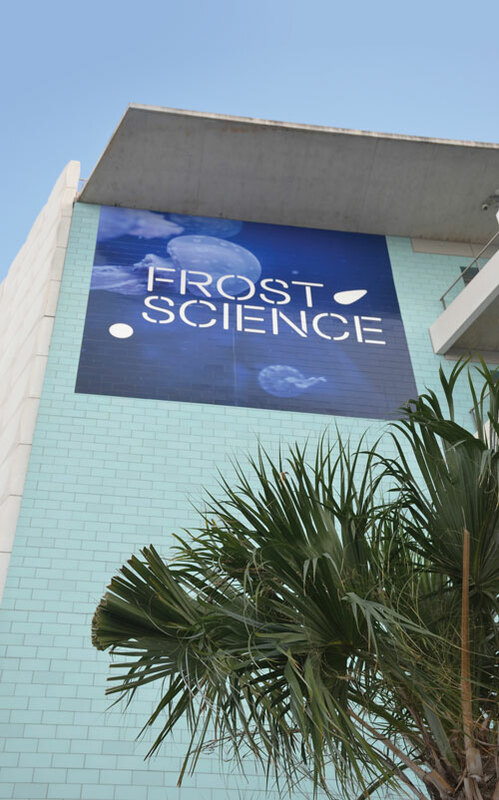 To plan your visit, go to the museum’s website at www.frostscience.org. “Since opening in May 2017, support for the Phillip and Patricia Frost Museum of Science has been immediate and overwhelming. We look forward to maintaining this momentum in the years to come, solidifying our place as one of South Florida’s premiere institutions and furthering our mission to make science attainable to anyone regardless of age and background. 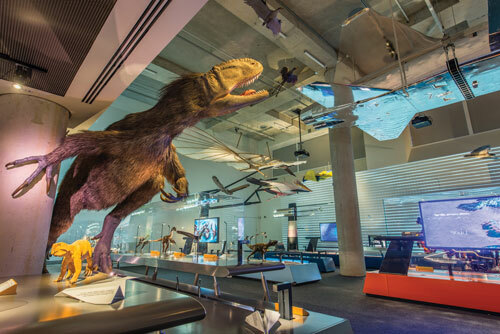 This also extends beyond the walls of the museum, with our educational programs and community, restoration and volunteer initiatives.” – Frank Steslow, President of the Phillip and Patricia Frost Museum of Science.